None of this style sheet stuff would make much sense if you didn't get to see it in the context of a complete example. Listing 10.1 contains the code for an XML document that stores a couple of contacts. This document is an example of how you might use XML to store a contact list for personal or business contacts. Notice in the code for the Contacts document that an external style sheet (contacts.css) is associated with the document through the xml-stylesheet processing instruction (line 2). Beyond that, there is nothing specific to style sheets in the XML code. However, it's important to understand the role of a style sheet in this example, which is to display the mailing address for each contact. Knowing this, it is necessary to hide the phone number and company name when formatting the content for display. This is accomplished in the contacts.css style sheet, which is shown in Listing 10.2. This style sheet relies on familiar style properties that you learned about in this tutorial. 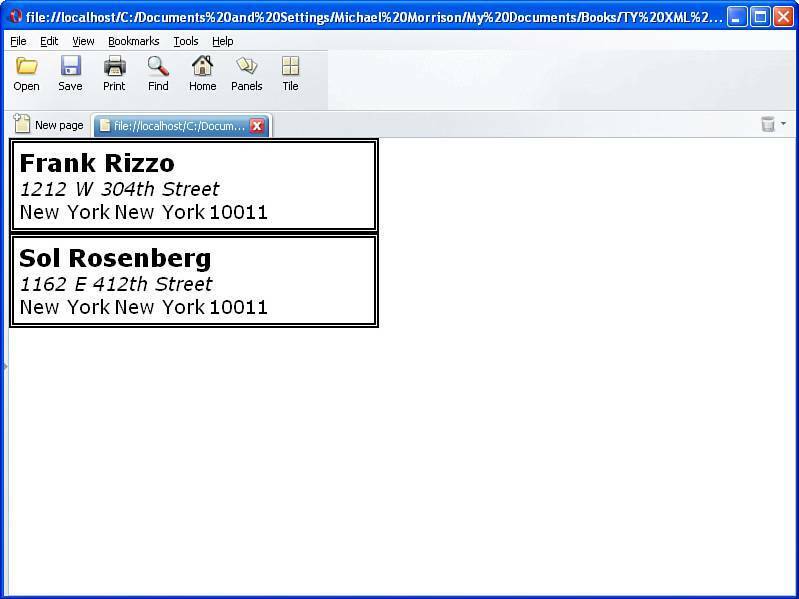 Each relevant element in the Contacts document (contact, name, address, city, state, zip, phone, email, company, and notes) is styled in the style sheet so that its display parameters are clearly stated. A border is established around the contact element (line 6), which contains the remaining elements. The other important code to notice is the code that hides the phone, email, company, and notes elements so that they aren't displayed (lines 3133). This style sheet results in the contacts being displayed as a list of mailing addresses that easily could be printed out as address labels (see Figure 10.1). Figure 10.1. 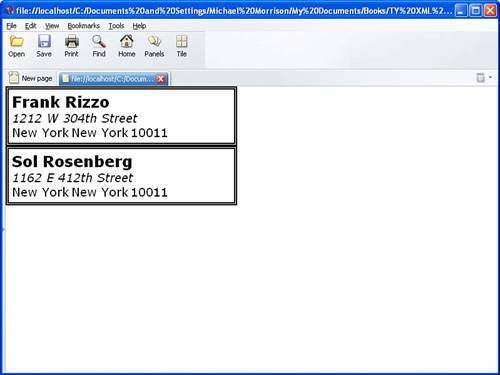 The Contacts example document is displayed in Opera using the contacts.css style sheet. Although the contacts.css style sheet is relatively simple in structure, it is nonetheless a good example of how CSS can be used to format and position XML content on a page for viewing.